Holy Fire Japan: Only in Japan: Kentucky Fried Christmas!! Only in Japan: Kentucky Fried Christmas!! As I came home from work this Christmas Eve, I was once again reminded of the interesting differences between Japanese and Americans. Christmas itself is an imported holiday for the Japanese, which means it is obviously around for commercial reasons rather than religious. Yet I can`t help but snicker when I see dozens of people, sometimes close to a hundred lined up at a KFC on Christmas Eve! The Japanese tradition of Christmas Eve dining is with the good ole Colonel and his bucket of greasy but tasty chicken. When asked by Japanese, "Do you eat KFC for Christmas in America?" I look at them and smile, and say "I never have. I am sure some people might, but we usually eat something more grand than chicken, like roast ham, or turkey." They look at me surprised, with an expression that says "well isn`t chicken and KFC from America?" The irony of it all is to see them line up for hours just to fulfill some tradition that most probably think is American or Western in nature when in reality KFC (Kentucky Fried Christmas!) is something that happens only in Japan. It's interesting to see how traditions transmute when they're exported to a different culture. For example, the forms Zen Buddhism has taken here in the US. @Nothingprofound thanks for the comment! Great point! I see that when I return to the US often. The perceptions of culture and tradition certainly become twisted traveling to and fro. It challenges one's views of normalcy and personal tradition. It's well known that prominent Buddhist families or Tera no ko have lots of money I mean millionaire status. Dude! that is too funny! we have lost the meaning of Xmas, we have forgotten that captain/colonel KFC is Jesus himelf.would you like that with cheese or fries? 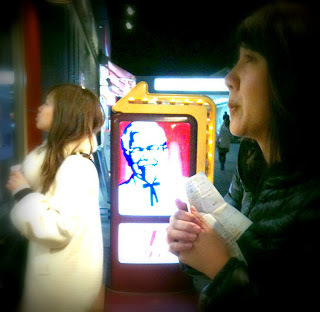 I pray God will use whatever it takes to reach Japan with His free gift of salvation...even if it is KFC chicken. May their commitment to seek tradition be turn to be a commitment seek & know Christ Jesus.